The five cent coin, not the metal. 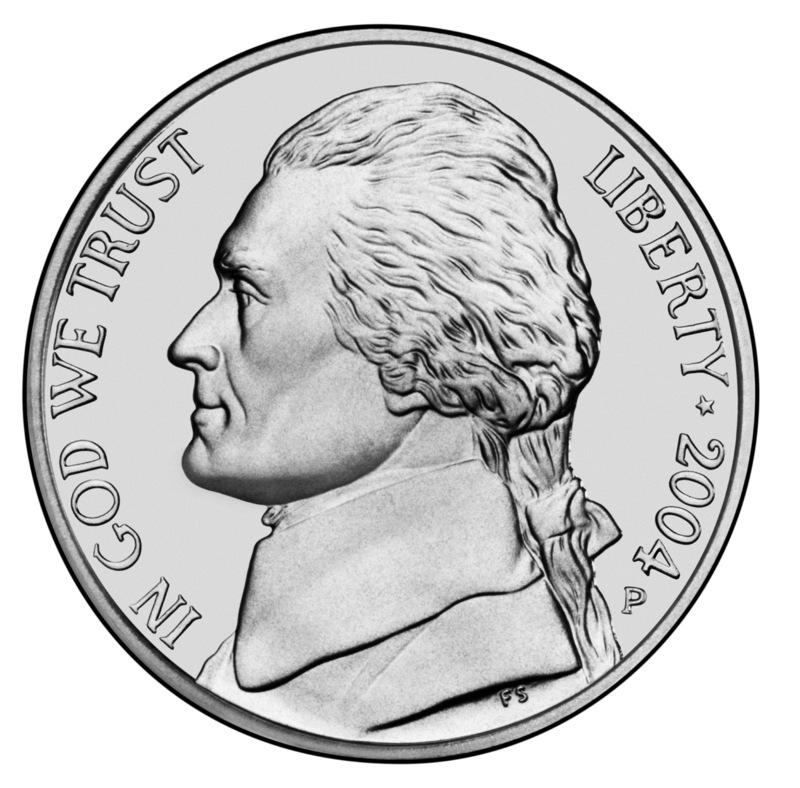 And only the real nickel, not the wooden kind, because the wooden nickel is funny. The real five cent coin is not funny. 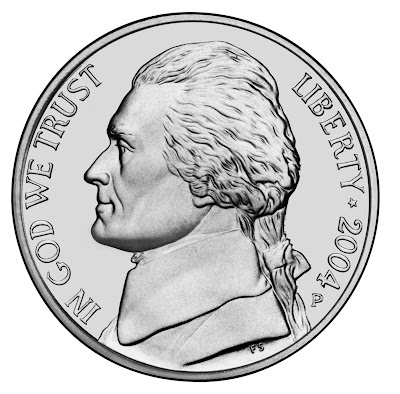 The real nickel is an affront to logic, to common sense, and seems to have been specifically and purposefully designed to shoot little splinters of pain, inconvenience and frustration into my life throughout the day, just like "witty" bumper stickers and finger food that falls apart when I try to eat it. I'm talking to you, pocket-hogging, piggybank-loving, monetary land anchor hoving your way into my jeans under the guise of Thomas Jefferson. Pocket change in general is a nuisance, but you are by far the main offender. The quarter is also a big coin, but he's worth five times as much as you, and he's not nearly five times as big or as heavy. The dime is the darling of the coin family, and the over-achieving, All-American big brother who really puts you to shame. Roosevelt is worth twice as much as you, is roughly half the size, not to mention much slimmer, AND he also has those cool ridges on the rim that make him easy to grip when inserting him into soda machines in Midwestern states like Nebraska, where they're still in the process of figuring out that whole internet/credit card thing. The penny, you might be thinking, has the lowest value-to-weight ratio. And you're right, but the penny is also so worthless that I don't mind leaving him in the give-a-penny-take-a-penny jar in front of the register, or even tossing him over my shoulder in the parking lot while I'm walking back to the car. The penny has the additional advantage of making me look generous everywhere I go. Whenever the cashier tries to hand me a penny back as change, I give her a smug grimace and a benevolent, patronizing wave of the hand that says, "Please my dear, keep the scraps." That being said, and despite how much I love throwing around money that's not actually worth anything, I have some ideas for how the penny could be improved as well. The penny should be made out of a forty-pound block of the cheapest metal on earth, whatever that is. It should look exactly like it does now, only about three feet wide. It should remind people of a glorious copper shield that could be carried into battle; but only by a warrior who wanted to die, because it would weigh forty pounds and there wouldn't be a handle so he'd have to use both hands to carry it, and he wouldn't be able to run very fast with it either. A one-cent piece like that would teach stingy people a lesson. Let's see my cheap Aunt Sally try to pinch that penny! And the older and stingier you were, the less you'd be in bodily condition to roll the giant discs around. 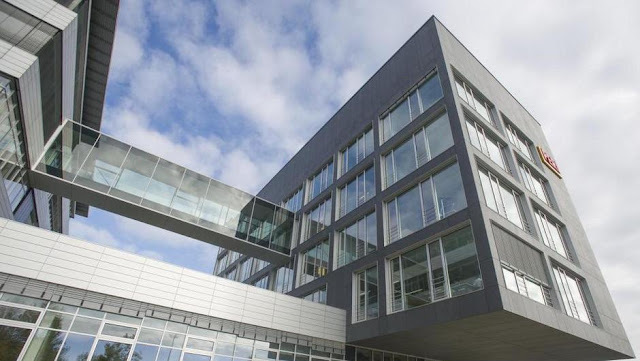 People who found a penny and picked it up would have all-day-long good luck because of the endorphins released from the physical exertion of hoisting the metal boulder up off the ground. In this old Batman comic, Bruce Wayne and a friend pay the price for their avarice. 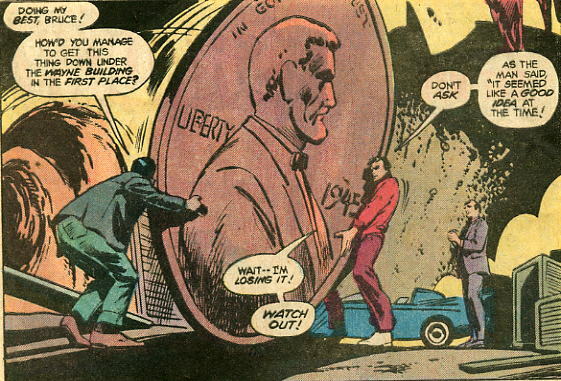 Being a billionaire, Bruce Wayne's insistence on picking up the giant penny is especially miserly. But that's neither here nor there. This letter is about you, Pentapest. You've been hiding behind the skirt of that sham Federal Legal Tender for All Debts Public and Private status for long enough, Nickel. You're too big to keep and too valuable to throw into the trashcan without the ghost of my grandma who grew up during the depression whispering guilting admonishments into my ear like, "just imagine how many hundreds of dollars you'll be throwing away over the course of your life if you keep chucking nickels down storm drains." 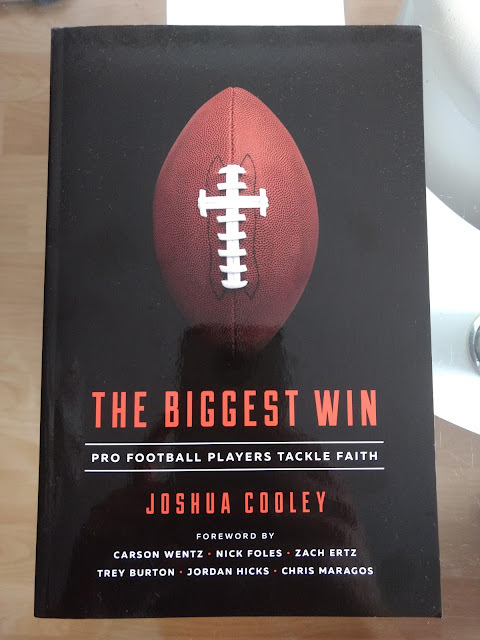 It's time to stop trapping people between guilt on one hand and walking around with a clinking, clacking, five-pound paperweight worth 45 cents on the other hand. You're a menace to society, and like most Americans you need to lose some weight: either that or disappear all together. Then we'd get five pennies back every time instead of a nickel, and for some reason chucking five pennies into a crowd from a second story balcony doesn't seem like as much of a waste as tossing one nickel. Maybe that's because at least with the pennies you have five chances of beaning someone in the head and getting your money's worth.